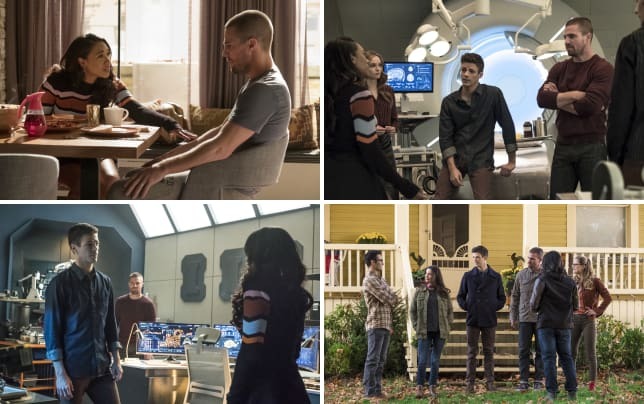 It's not easy to maintain the excitement of a three-night event, and Arrow Season 7 Episode 9 fell short of The Flash Season 5 Episode 9. 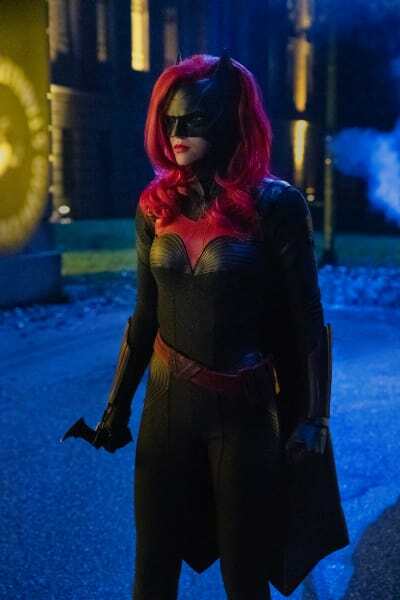 The aim was to introduce a brand new character in Kate Kane, a new superhero in Batwoman, the grail of comic cities in Gotham, and successfully lay the track for the third episode of the trilogy. All of those things were done, but the transition from the first installment to the third wasn't as smooth as it could have been. Instead of the second part of Elseworlds feeling cohesive, it seemed more like what it was -- the boring middle part of a journey. The car is moving along the highway, and all there is to do is keep pushing forward. There wasn't much in the way of story development, but there were a log of singular moments that addressed what had aired previously. Most of the magic between Oliver and Barry as a result of their switch had worn off, and that was an absolute gas for the first hour. 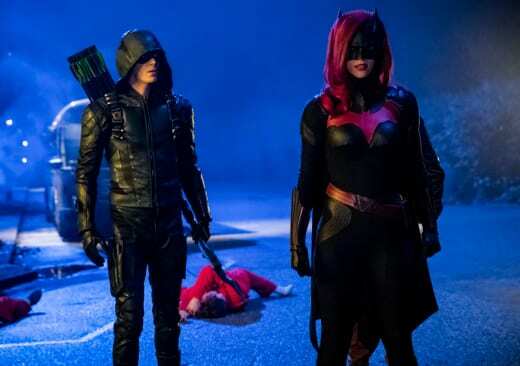 Once they hit Star City, it made Felicity feel like a lesser wife than Iris for not noticing the difference straight away, and it was unfortunate timing for their first meeting with Kate Kane. When meeting a new heroine who is also the cousin of Batman, it would have been ideal for the guys to be themselves. Putting their best feet forward for such a momentous occasion might have made her a little more ... welcoming. Barry: Yeah, I'm Oliver Queen. Yeah. And you are? Kate: The rain on your parade. If you're in Gotham to compare grappling hooks with Batman, you are out of luck. No one's seen him in years. Instead, Kate was highly unimpressed with the group as a whole and couldn't wait for them to get the hell out of town. Kara and Supergirl found common ground with her new counterpart, and I wonder if that means should the Batwoman series come to fruition any possible mini-crossovers would occur between Supergirl and Batwoman. Ruby Rose was at times exactly as I expected her to be in the role because of how she's acted in other roles, such as her part on Orange is the New Black, but when Kate strode purposefully toward her Batwoman costume for the first time, she was a little bit offputting. Kara: I gotta say, all the corporate billionaires I know wear Versace and have 500 fewer tattoos. Kate: Those are the ones that you can see. Permalink: Those are the ones that you can see. There is maybe a little too much Batman in Batwoman. Rose is emulating the way we'd expect The Dark Knight to speak. 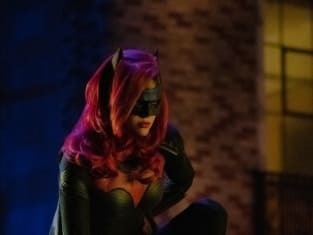 Is Batwoman in the comics that kind of character? Dark and broody? I leave it up to you as the comic fans to report because I have no basis in fact to make a judgment. It didn't play consistently throughout her performance which is why it stood out. I liked Kate with less doom in her voice, but with an edge. Rose has a unique quality about her without putting an extra spin on the character. The "Barry acting like Oliver" layer doesn't seem necessary. 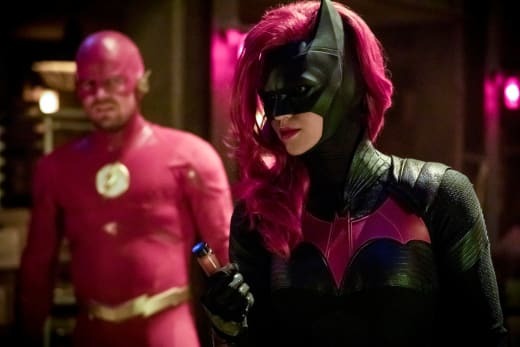 But with some tweaks, tuning into a Batwoman series wouldn't hurt. Maybe Cisco could join her so he could elevate past the fourth tier on The Flash. Gotham also partly revealed why John Barrowman was on set again. As Oliver and Barry struggled to identify with each other and understand what it means to walk in the other's shoes, a chemical spill forced each to fight the other's former first season demon. It never dawned on me how big of a rivalry there was between The Flash and Green Arrow. Oliver and Barry rely on each other a lot when things get bad. Their jealousy has been played for laughs, but the scene suggests it was a lot deeper than that. Going forward, it should get less play now that they are more aware of the burden the other has carried. Meh. I kind of enjoyed the horsing around. If they can find other reasons to go at each other like brothers in the future, then they can remain more knowledgeable. Otherwise, can we just keep it fun? All of the body switching comes down to a dude called The Monitor preparing our heroes for something bigger than they've ever experienced before and across the multiverse. 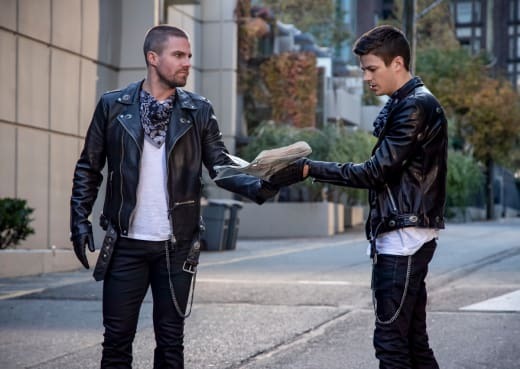 He's the guy who was chatting with the unknown Flash from Earth 90 at the beginning of Elseworlds Part One and who gave Deegan the Book of Destiny. From what I can tell, The Monitor thinks Deegan can make the situations so difficult for our heroes that it's almost impossible for them to find their way out of it. And only if they do find their way out of it will they be strong and worthy enough to manage whatever crisis is coming. Whether switching is going on all over the multiverse was unclear. As Barry Allen from Earth 90 looks like Jay Garrick and Barry's father, it could be just an anomaly from the Allen family. Those genes obviously run through it. That Barry Allen wondered where Diggle's "ring" was, though, indicating he should be a hero of another nature, too. Green Lantern, perhaps? It's weird that The Monitor keeps returning the Book to Deegan since he's clearly not of sound mind. If he failed last time, why does The Monitor think Deegan is up for the task? And Monitor must be a good guy if he's trying to ensure the safety of the Multiverse. It's also odd there isn't some kind of more traditional training he can invent to put the heroes though other than only switching Barry and Oliver. Arrow Season 7: Who is Blackstar?? But, that's not the case, is it? 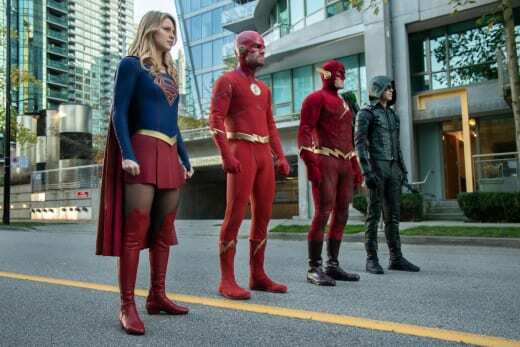 As the trailer for Supergirl Season 4 Episode 9 suggests, Clark Kent is getting the old switcheroo come Elseworlds Part Three, as Superman dons the much ballyhooed black suit and seems to have gone rogue. 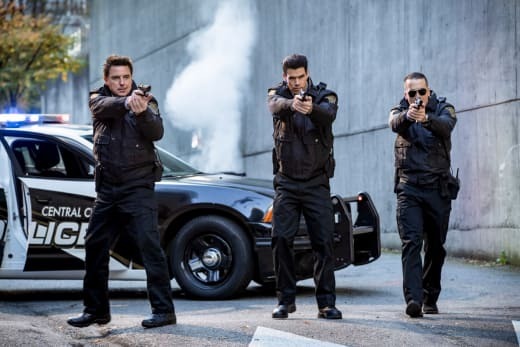 Diaz and Malcolm are cops in the latest version of reality, and it's where we see the twinsies that are Oliver and Barry. They look like total dolts in their matching outfits, and it would be awesome if someone they know could see them dressed together, but at least they made the cover of the paper. To make their recovery from the latest reality a little more difficult, they're lost their heroic status completely and are criminals on the run. Say hello to the Trigger Twins! With reality in flux yet again, it makes you wonder how much of what we've experienced is true. If Ruby Rose isn't received well as Batwoman, can they recast using the excuse that she was, at the time, in a different body because of the fluctuating realities? It's an odd time to introduce a new character when you think about it. It was fortuitous for Oliver, who for some reason felt more comfortable talking with his wife as another man than he did as himself. Maybe someone can explain that to me, too. Why would the words he spoke be better received coming from Barry? Oliver: Maybe it's easier for you to hear this coming from Barry Allen. Oliver: That we're going to be OK. People change, Felicity. We're growing. It means we're evolving. Except for one thing. One thing that will not change is how I feel about for you. Love is too small a word. And no matter who you are or what you become and no matter who I am or what I become, you will always be, you will always be the love of my life. People change. That never will. And just like that the misunderstanding Oliver and Felicity had during Arrow Season 7 Episode 8 is water under the bridge. Will this Elseworlds experience permanently alter Oliver's demeanor? His approach to the conversation was different than usual. These encounters rarely have any lasting effects, but it would be welcome to see Oliver laugh once in a while and smile more often. When he does find an occasion to smile with his on gang on Arrow, he usually looks like he's about to poop his pants. The freer, more comfortable Oliver who isn't afraid to laugh at a broken thumb making an appearance here and there when appropriate would benefit everybody. What did you think about the introduction of Batwoman? What multiverse crisis is coming that will test the entire group more than ever? Are you happy Oliver and Felicity patched things up so quickly? 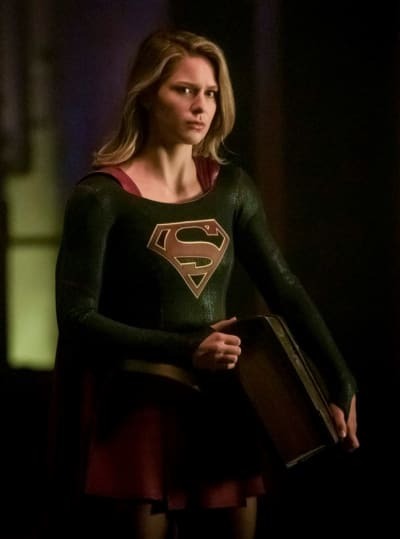 Get ready for the final chapter on this Book when Supergirl airs in the normal time slot of The Flash Tuesday at 8/7c and watch Arrow online if you're new to this one. Barry: Guys, take a look at this. [uncovers the Bat signal] Do you still think he's a myth? Barry: Could you pull that thing up because my vigilante identity's not public, and I'd like to keep it that way! Oliver: This is not your real face!! Barry: It might end up being my real face if we don't sort this mess out, so could ya?! Oliver: [pulls up hood] Happy? ?